the names are up for the name game – you can see them here. and after thinking about it a bit, i think this will be our last name game. but in light of that decision, if you choose to buy the yarn you name, you’ll get 10% off and free shipping to US and Canada. 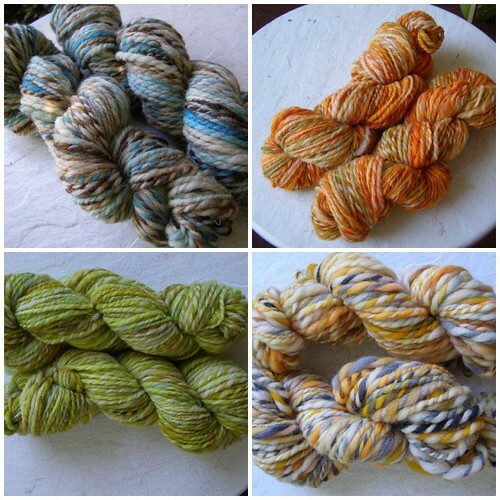 if you don’t choose to buy the yarn, anyone else can take it and get free shipping. in other fun and exciting news, from here on, i’m going to have guest namers. each guest will be responsible for naming a batch of yarns, and will get a 10% off coupon for the shop and have their blog/etsy shop and what have you promoted on my blog. i’d also like to do a small interview. we’ll see how it shapes up. thanks for all of you who have ever played! it was incredibly fun seeing what you came up with and i’m hoping this new era will be just as fun. please contact me regarding orange pekoe tea!! I finally ordered your book this week as a gift to myself and it arrived this morning. Wow – great designs and very nice pictures/ colours chosen! I’m looking forward to rummage my stash for suitable yarns.. Thanks for sweetening my weekend & compliments on your work! Have a great weekend yourself. Hey cosy – thanks for choosing one of my names. I had a blast flipping through the set and throwing names out there. I’m interested in purchasing chive butter, but money is a little tight right now. Could you e-mail me to let me know exactly how much it would be? I’d appreciate it! That’s a nifty new idea! Can’t wait! I’m so excited you chose my name for the Glacial Runoff yarn, I’ve never participated in the name game before but this yarn just called out to me. Please contact me with the details on it. Your new idea is, like all of your ideas, brilliant. It will be so nice to “meet” some new folks, and I bet you’re a brilliant host! I have to admit, though, that I’ll miss the name game posts. I had way too much fun with them!